Molten lava bubbles and flows continuously creating captivating patterns into the surface of Mount Nyiragongo Lava Lake. Viciously glowing lava lake astonishes the rare visitors, who dare climb on top of the Nyiragongo stratovolcano in the Democratic Republic of the Congo. 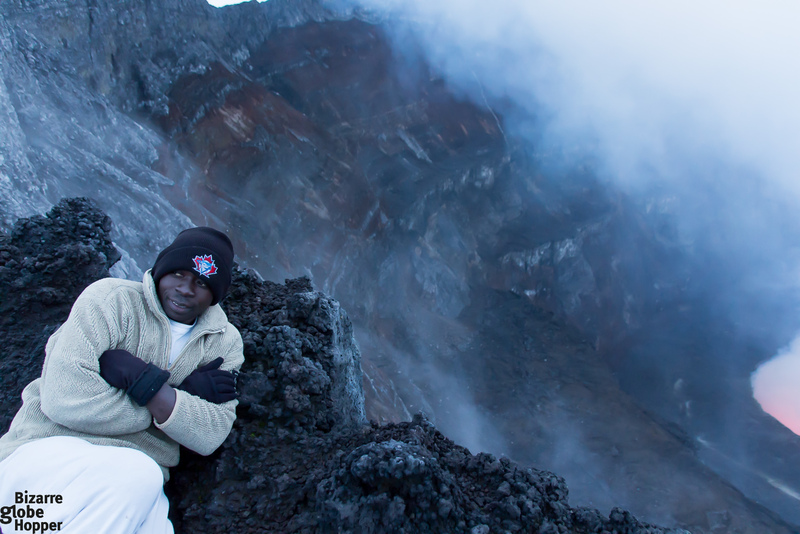 Spending a night at Nyiragongo crater edge is an adventure of a lifetime and a photographer’s dream come true. This article has been thoroughly updated in March 2019. 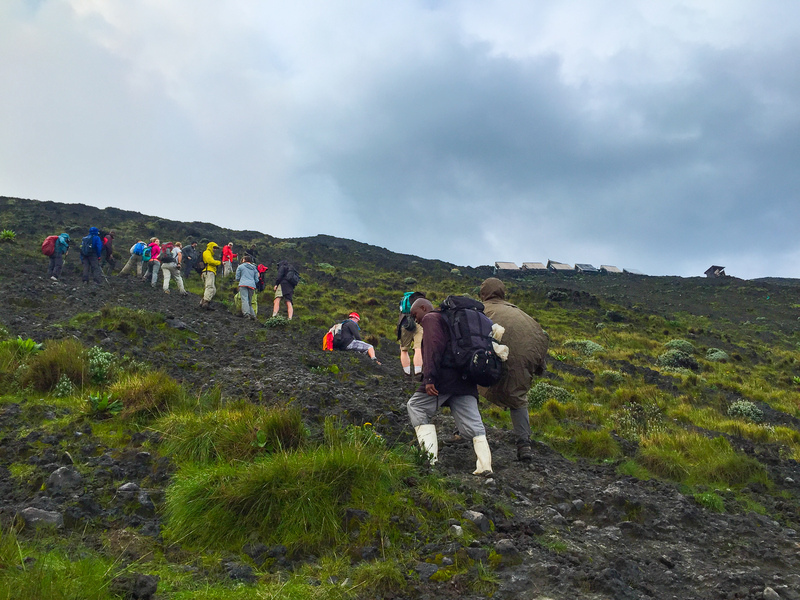 On February 15th, 2019, Virunga National Park was re-opened for tourists and Nyiragongo treks are running again. There are only seven lava lakes in the world, which are ranked as “persistent” or “nearly persistent” during the last decades. Currently, only four of the lava lakes are ranked as persistent and active: Mount Nyiragongo in the DRC, Erta Ale in Ethiopia, Kilauea in Hawaii, and Mount Erebus in Antarctica. To last, a lava lake needs a frequent heat source: the eruptions. Mount Nyiragongo Lava Lake is the largest lava lake in the world on with a maximum diameter of 700 meters. The size and depth of the lava lake vary because every eruption changes the surroundings. As the level of Nyiragongo Lava Lake is tied into the pressure inside the magmatic system under the volcano, it gives researchers valuable information about the magmatic activity. In simplified language: Nyiragongo Lava Lake helps researches forecast Nyiragongo’s future eruptions. In 1977, the lava lake drained catastrophically in less than one hour, flowing down and choking villages. Technically, the current Mount Nyiragongo Lava Lake activity is still part of the eruption, which started in 2002. Lava terraces on the crater walls mark the levels of previous lava lakes. At the Nyiragongo volcano rim, you can observe the churning lava lake at the bottom of the collapsed crater. To me, the lava lake resembled an interactive world map, where the borders were constantly changing and blending into each other. You can see – and hear – how the lava lake boils and spits fire as the hot gases explode. 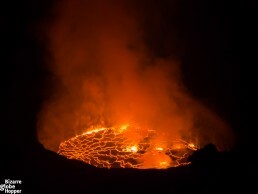 It’s the most beautiful sight I’ve ever seen and well worth the grueling hike to the Mount Nyiragongo summit! 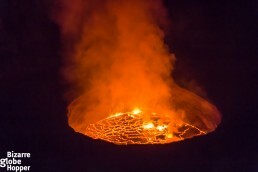 Nyiragongo volcano lies inside the oldest national park in Africa, Virunga, in the Democratic Republic of the Congo. The nearest town Goma is a 20-km drive away. 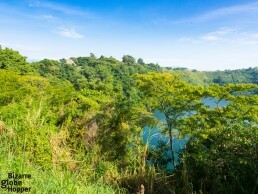 Goma is Congolese border town by the banks of explosive Lake Kivu, which DRC shares with Rwanda. Goma can be reached by road from the Rwandan border town of Gisenyi. When Mt Nyiragongo erupted in 2002, a lava stream covered the runways of the international airport of Goma. As of today, commercial flights are still out of operation. Mount Nyiragongo summit is reachable by a 4- to 6-hour guided hike, which starts at Kibati ranger station inside Virunga National Park. Only one hiking group is allowed to visit Nyiragongo summit a day. All groups are accompanied by armed rangers. Mount Nyiragongo volcano trek starts at the altitude of 1989 meters (Kibati ranger post). Since the trekkers ascend to the summit (elevation of 3470 meters) in just 4-6 hours, there’s a threat of acute mountain sickness (AMS). Temperatures frequently drop below freezing, so remember to pack warm layers. You can read our complete guide on Nyiragongo volcano trek – with packing tips and of course some amazing images throughout the hike! The lava lake lies deep in the Mount Nyiragongo volcano summit crater. During the night, the visibility is usually good. Scientists have descended from the summit to the bottom of the caldera, but that’s, of course, out of reach for ordinary travelers. 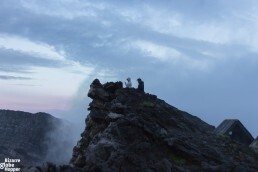 Please be careful at the volcano rim and don’t even plan to descend towards the lava lake. Chinese tourist died from falling to the Nyiragongo volcano in 2007. A wooden cross at the edge of the rim reminds of her tragic faith. Despite warnings of her guides, she had trudged 15 meters down the crater edge before falling down. There were signs of the landslide near the spot where she fell. ATTENTION: Virunga National Park is Open For Tourists in 2019: Gorilla and Nyiragongo Treks are Running Again! Virunga National Park authorities closed the park from summer 2018 to mid-February 2019, because of the various tragic incidents that had happened in Virunga in 2017-2018. After eights months of closure Virunga was re-opened for tourists on 15th of February 2019. Mount Nyiragongo treks are operational again. Is it Safe to Visit Mount Nyiragongo Lava Lake and Virunga National Park in 2019? As Nyiragongo is among the most dangerous, and active, volcanoes in the world, no-one can guarantee that it would be safe to visit Nyiragongo Lava Lake and the volcano summit. The security situation in the DRC and especially in the Virunga National Park during the last couple of years hasn’t been stable. However, now that Virunga is re-opened for tourists, the new safety measures will hopefully make visiting Nyiragongo Lava Lake safer again. 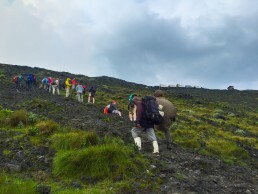 Generally, Mount Nyiragongo volcano treks are considered safe for healthy travelers taking part in guided hikes. However, the constant volcanic activity causes health risks for the surrounding communities. Carbon dioxide has caused deaths also recently. In May 2018, two British tourists and their Congolese driver were kidnapped by the local militia called Mai Mai. The Virunga National Park ranger who was trying to protect them was murdered. Although the tourists and their driver were eventually released, the chief warden of Virunga decided to close the national park for 3 weeks. In June, the chief warden informed that Virunga would be closed for the rest of 2018. Currently, Virunga is strengthening its security by training and recruiting new security officers. Before the tragic incident in May 2018, at least 12 other rangers were murdered during the 10-month period, which was among the bloodiest times in Virunga’s history. Is It Safe to Visit Virunga National Park and Mount Nyiragongo after 2019 Re-Opening? After Virunga National Park has re-opened in February, many tourists are wondering whether it would be safe to visit Virunga and Mount Nyiragongo. Virunga National Park authorities guarantee that they are “following a rigorous assessment of both the situation on the ground, as well as the Park’s security protocols”. The park authorities have a lot to lose, so they wouldn’t have opened Virunga if it would have been remained dangerous for tourists to enter the area. Our friends from the DRC have reported that the security situation is better now than during 2018. For now, tourists are allowed to visit only stable areas of Virunga. Only gorilla treks and Mount Nyiragongo treks are available until further notice, as rangers can guarantee the safety of these treks. Due to the low silica content, Mount Nyiragongo’s lava is more fluid than in any of the other lava lakes in the world. Steep stratovolcano cone and the fluid lava pose hazardous eruptions: Nyiragongo’s lava flow is fastest in the world: it can reach speeds up to 100 km per hour! Last deadly eruption happened in 2002 when more than 15% of the city of Goma was destroyed and 147 people were killed. 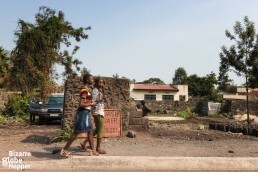 The debris is still visible everywhere on the streets of Goma: check our photo essay on Goma. Mount Nyiragongo and its (little) sister volcano Nyamuragira make up a staggering 40% of Africa’s volcanic eruptions. We’d recommend prebooking the Nyiragongo trek through a Congolese travel agent, who can also arrange your Congolese visa, meet you at the border and offer transport to the starting point of the Nyiragongo trek. Without a travel agent, getting a visa to DRC is nightmarish. We had to bribe border officials to enter the country, although we entered the DRC with our travel agent. It’s much easier to prebook Mount Nyiragongo trek package through a travel agent than try to book it yourself through the national park. The packages include trekking permits, guide, porter, and meals. 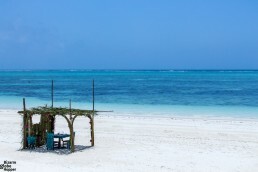 The price difference is minimal if you negotiate with your travel agent, and the package deal will make your trip to the DRC much more hassle-free. Before planning a trip to Nyiragongo Lava Lake and Goma, please check the current security situation in the DRC. Have you visited Nyiragongo or some of the other lava lake – or would you dare to take this kind of fiery adventure?